People are ignoring this blog. I know. I have a hit counter there which tells me so. If people are ignoring the blog, they are probably ignoring the show. It doesn't seem to have gained a significant traction with La Mama, and I don't think Pippa or Becc or anyone else really know what it's about. (explanatory edit: Most people I have spoken to are unaware of the scandal or have only a scant consciousness of Mike's monologue, apart from a few select people who happen to listen to TAL or follow Mike Daisey's work) .Possibly it will sink without a trace. So, I must live with that. Someone takes action - they of course have to live with the consequences that they may be ignored. My work may be for nothing. It's not a new thought. I'm also not the first person to have had this thought, and it is not limited to the field of the arts. In some ways, it's easier to have this thought when other people are there with you, and you can share it. If this was a two hander, at least someone would be there to talk to about it. Being ignored brings into perspective the battle for significance faced by an artist.Often in the theatre, we do not experience this, because usually we are working with other people. No doubt Mike experienced this same feeling. "People have to hear this story. They have to listen. I'm going to keep working until they listen..." it's this kind of self-belief which carried him through, which made hims significant. And likewise, he is also ignoring me. Is all this work for nothing? 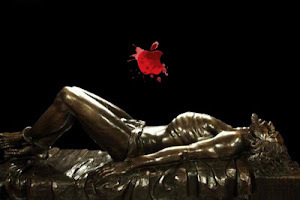 I have confirmed a theatre for one-man performance of your play 'The Agony and Ecstasy of Steve Jobs', it will be at La Mama theatre Melbourne for a season of 6 performances over 6 weeks, beginning 20th May. It'll be on Sunday arvos at 2pm, sort of a Sunday forum feel. It's only a 40 seat theatre. I'm not a performer, I'm a director. I think I will be honest and create a bad copy of your performance persona, and generally the performance will be not of high acting quality, because I have only ever studied acting from the outside. I will however undertake a close examination of your performance style and the text. I will take your performance and the text apart, analyse it, and put it back together for re-performance, (sort of like one of your American soldiers would take his gun apart and clean it before putting it back together ;)) The result will be a performance that employs Brechtian ideas to encourage the audience to reach their own conclusions and to investigate for themselves their own truth. Therefore I want to salvage your show as an example of an authentic individual investigation and of interest is the subsequent massacre by media interests, which include Ira, who champion an idea of truth which has at its heart a disempowerment of the powerless individual. I will be assisted by Felix Ching-Ching Ho who is from China, and will serve as my director and operator and she will also refill my water at some point during the performance. I want to do the performance in a t-shirt with LIAR written on it and in a Hawiian shirt with a pillow stuffed down my front - do you think this is ok? I know it's satirical, but I think your actions must be put under the microscope, and you have been branded a liar by many, there is no escaping this. Although you must know I am sympathetic or I wouldn't act. I have commented in various internet locations under "Richard" or my alias 4coffins, especially on the blogs of George Hunka and Alison Croggon. My opinion evolved over the course of events subsequent to the This American Life retraction. Hopefully you are very well and still responding okay after the last few weeks. Congratulations on your decision to release the text, it is brave but will eventually reward everyone. Feels a little like I'm screaming into a void at the moment... I know you're probably very busy but if could spare me a line it would make me feel better about doing this entire thing. I'm only 10 days out from first performance now. I'm writing to you because I have encountered an ethical problem, which is what to do with the money earned. I don't believe in giving my work away for free but I also don't believe in pocketing profit from a show like this. I was thinking about making a donation to Foxconn, but acting like a kind of World Bank, so that I would donate the money only if they were contractually obliged to use it to improve the rights of workers. The subsequent legal and contractual headache would be an interesting piece of satire. My girlfiend Sonja was really angry about the idea, she doesn't think I should be lining the pockets of such an evil company. And anyway they haven't replied. That idea came from the thought that it would be good to donate the money to an organisation in China which helps the rights of Chinese workers, but I don't know if such an organisation exists legally. I thought you might have some ideas about where to donate the money to. This is Sonja's artwork for the show. "My girlfiend Sonja was really angry about the idea, she doesn't think I should be lining the pockets of such an evil company." That is a misrepresentation of my views. I think that puny acts of satire in the "real world" go unnoticed unless they are framed as art. On another note, having sat through performance no. 1, I am convinced that both Mike Daisey and Ira Glass should hook up via Skype to see this very simple presentation of the stoush in all its tangled complexity. Unlike Rich, I heard the initial broadcast of Mike's monologue before it was retracted by Ira Glass, This American Life, journalism & co. It made an impression. The retraction episode, on the other hand, passed me by completely until Rich began following the debate. Having listened to Richard nut on about it for quite some time now, I am still undecided about how to "frame" grand acts of truthtelling that merge fact and fiction, either in "art" context, or in "life", particularly when so much is at stake and such an urgent brave new truth needs to be conveyed. Rich has very keenly taken Ira to heart with the "honest labelling" schtick. His T-shirt reads LIAR, stark white-on-black. But Rich's version of the Agony and the Ecstasy has an internal integrity of its own that layers many inaccuracies, large and small, with a kind of transparent openness you don't get on either This American Life or Mike Daisey's original monologue. The blurs in the original four test photos, accidentally left inside an iPhone, lead Mike to Szenchen to investigate. His super mongrel combo of fact, fiction, and American dramatics are broadcast throughout theatre networks and then cast as fact on journalistic radio program for hipster elite This American Life. Apple's incongruous and dirty exploitation of cheap labor lies exposed. Steve Jobs' entrepeneur-demonaical contribution to the world is a collusion with the strange momentum of capital. The lie behind the slick logo and super expensive merch, the unecessary buying of ridiculously aestheticised technology, the wanton unfettered fueling of blind consumerism. All well and good. Then Ira Glass is tipped to fact-check, Mike is accused of lying, new facts slip into fabricated fictions, the cause is undermined. Somewhere along the line, Cathy (Mike's Chinese translator) has been interviewed in private. (Would she have a motive to lie here, too? I wonder what Mike has to say about this). I note the supreme irony: that journalists selectively present stuff in certain ways ALL the time, and Ira is guilty of this, too, and can't NOT be aware of it. Why isn't Ira honest, why doesn't he display the same level of honesty as Mike does in the retraction episode? I find this, in particular, incredibly disappointing. No fingers are pointed, but this adaptation takes place in the context of the descent into complex half-truths and outright lies media reportage inevitably slides into when things get too crazy for the ten-minute sound bite and this, too, is layered into the fabric of Rich's adaptation. The show remains entertaining, which (I've come to realise, despite deep suspicion of entertainment) is paramount in this particular piece of theatre because too much is at stake here for us to skip a beat (although admittedly: occasionally I get bored, because after at least 20 hearings I find bits of Mike's monologues utterly superfluous). After 20 hearings & a million conversations with a heap of people about this issue I have also finally realised, seeing the Agony and Ecstasy performed this way -- carefully couched so the lie of the territory is exposed, the layers of half-truths, the conflicting motives -- that there is an open honesty about this thing on at LaMama in Melbourne that goes beyond telling the truth. Pls excuse many brackets and long sentences in above post written in a hurry on cold late Sunday eve. Sonja, Mike addresses some of your concerns in his talk at Georgetown University http://soundcloud.com/mike-daisey/georgetown-talk which he gives a couple of days after the retraction episode and is well worth a listen. I think he describes Cathy as a "Lovely woman" and doesn't say too much more about her. 'tis not through lack of understanding or through lack of interest but through lack of time that we don't respond. I recommend that you petition nedd (at) lamama.com.au in order to get some traction for the blog. He is La Mama's Communications Coordinator and best placed to draw attention to it. Hello Richard, as a long time listener of TAL - I heard both episodes. I am a theatre practitioner in Melbourne and I was not aware that you were performing this piece. I have to say that I am curious that you would do so. For me this piece feels deeply personal - and when I initially listened I was caught by the intensity of Mike's feelings towards what happened. I can't be sure, but I think that a large part of the appeal of the piece comes from knowing that you were listening/watching the person directly affected by it. I wonder what might be lost with a removed party performing it? I don't say any of this to be discouraging, theatre is for exploration and we can't completely know what will work until we deliver it to the audience. That said - I'll come and figure it out for myself I guess. Best wishes for the run. Hi Brigette, thanks for posting. I agree with much of your concerns and I decided to learn this work and vomit it back up despite all these reservations and not because of them. I was guided by Mike and Jean-Michele releasing the script on free performance rights, and encouraging people to perform it, which suggests to me that they want to combat the existence of the work in the media by having it performed in theatres. There home made contract makes for fascinating reading and can be found as a prelude to the script on Mike's blog. These actions are in part revolutionary and I am interested in participating in this as I think potentially reverberates beyond the nuts and bolts of the work (Chinese workers making the iPhone, Steve Jobs life) into something more universal and potent. As for the 'removal' of which you speak, it creates interesting schisms when I am talking in first person as there are varying degrees with which I relate to what he is saying. For example, he says in one part about how he remembers getting his first computer, something I remember vividly, and our experiences weere similar. Often his writing style is very similar to something I might have written. However, at other times, both his experiences and writing style are completely different. This is particularly interesting when I come to a point in the performance where the truth is contested or in which he has directly said he is fabricating. At these points during performance, the relationship between me and the word "I" is particulrly tense. I am also wearing a t-shirt with the word 'LIAR' written on it. What's your take on what happened?? If you don't mind me asking. It's funny you should ask, I had a think about that yesterday when I was replying to your mail. It struck me that I didn't care that Mike had lied. I viewed it as a performance from start to finish - whilst I found it moving and well written I was not affected on a "socially conscious" level. I guess that Mike's performance simply added to the enormous number of inequalities that are documented by many, many people. I listened, I enjoyed his cadence, timing and intensity - as an audience member enjoys a performer who seems affected by their text. When the TAL team made Retraction, I listened and was interested, but I was annoyed with Ira. And I love Ira. I was annoyed because I felt that a simple paragraph would have sufficed. Letting us know that not all the facts were able to be checked and that some were untrue. I felt irritated with the dogged way that Ira went after Mike - Mike lied, but as far as I was concerned all theatre makers are liars - we create stories that we sometimes have no experience of, but this doesn't make them LESS true. Not true for us as the theatre makers, but more than likely true for someone. That's the point of theatre - to reflect back life - graphically, or eloquently, or succinctly. etc. So, I liked Mike's piece, I felt let down by Ira's righteous indignation (which felt personal) and the forensic way that they broke his performance down. I realise that TAL pride themselves on well researched episodes and I can see how it would be disturbing for them to realise that something they thought was "literally true" was not. However I listen to the show for the quality and breadth of the reporting - a simple apology would have sufficed "we thought it was was one thing, and it turned out to be another". one of the problems with staging this play actually is that whilst there is something to be learned for many, with some, there isn't so much to talk about. I think Mike probably found this too. I think you're right about most things - I believe him more now than I did before. I suppose I instinctually feel as though everyone was involved in making this piece of theatre... Ira, Mike, Scmitz, and me... this is how the show was always intended to be realised... that's the only justification I can think of for Ira's actions, that he is secretly a theatre-maker. I just don't buy all this "media acurracy", I think Ira knows as well as anyone all that stuff is dead and buried. The media lie to us consistently and continually now, and if not they are distracting us - they have abandoned any and all accountability they ever had. The episode after the retraction was "In Dog we trust" and was about pets in the home. What happens in the media only happens in "Media World", it has no relationship with the real world. To take action in the name of supporting media ethics is to put the defibulator to JFK. It's a nonsensical action. 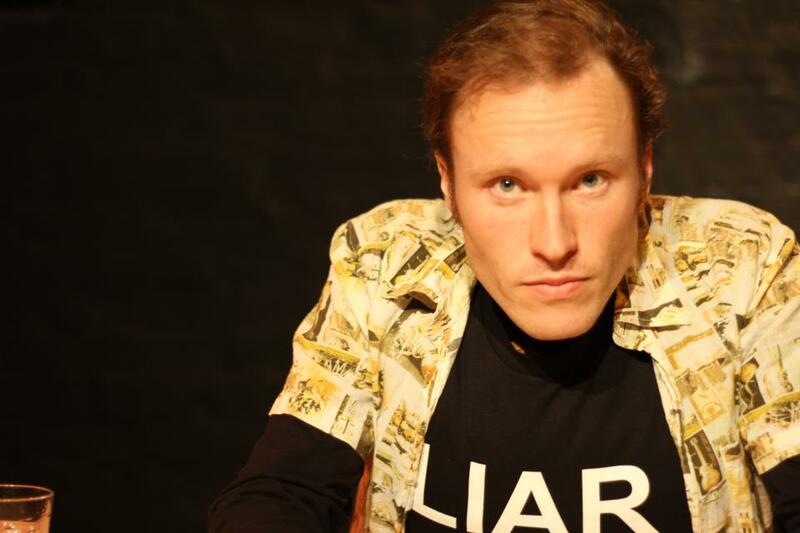 Richard Pettifer is an Australian theatre director and performance artist based in Berlin, Germany.